All modern ham radios have perfectly usable receive and transmit performance. The differences involve performance in several key areas, such as capability to receive in the presence of strong-signals, signal filtering and filter control capabilities, coverage of one or more VHF/UHF bands, operating amenities such as subreceivers, and number of built-in antenna tuners. Basic: This radio includes a simplified set of controls with basic receiver filters and signal adjustments. Controls may be fixed-value, with on and off settings. The radio has limited displays and metering, connects to a single antenna, and has minimal support for external accessories. A basic radio is good for a beginning ham and makes a great second or portable radio later. A computer control interface may be available. Journeyman: This radio includes all the necessary receive and transmit adjustments and may have front-panel controls. It has an expanded set of memory, display, and metering functions. You can find models that have additional bands and support for digital data operations. Internal antenna tuners are common, as are connections for external equipment, such as transverters and band-switching equipment. A computer control interface is included. High-performance: This radio has an extensive receive and transmit controls on the front panel or controls that are configurable via a menu system. Computer-style screen displays are popular. A state-of-the-art receiver and subreceiver are included, along with complete interfaces for digital data and computer control. Most high-performance radios have band-scope or panadapter displays that show signals across a wide frequency range. Internal antenna tuners are standard, and some antenna switching usually is provided. The major ham radio dealers have organized their catalogs and websites to help you find the right radio for what you want to accomplish at a price that fits your budget. Start online, collecting information on the radios you like; then head for the product review sections of eHam.net and QRZ.com. Your club members may have some opinions as well. ARRL members have access to the detailed product reviews published in QST, including complete technical evaluations by the ARRL Lab. The reviews cover everything from top-of-the-line transceivers to microphones and power supplies. Recognizing the rapid growth in mobile and portable operation, all manufacturers offer small, rugged radios. Each year, more bands and better features are crammed into these amazing radios. These radios are quite capable as base stations if you have limited space at home or desire a dual home/portable station. Many radios include coverage of VHF and UHF bands on the weak-signal modes (SSB and CW) as well as FM. Be aware that because they’re so small, these radios have to make some compromises compared with the high-performance designs. The operator interface is, by necessity, menu-driven. This menu-driven interface makes some adjustments less convenient, although the most-used controls remain on the front panel. The smaller rigs don’t include internal antenna tuners at the 100-watt output level, as the larger rigs do. If you have an RV or a yacht, you may not have a problem fitting a radio, but in a compact car or an 18-foot runabout, the space issue is quite a challenge. Luckily, many radios designed for mobile use, have detachable front panels (sometimes called control heads), which allow you to put the body of the radio under the dash or a seat or on a bulkhead. As when evaluating these radios’ larger base-station cousins, you have to consider features and accessories. Because these radios have a minimal set of controls and are menu-driven, you should try one before you buy it. If you don’t have a friend who owns one, visit a retail store. If you can borrow a mobile radio before buying it, make sure that the control head can be mounted in your vehicle where the display is easy to see and the controls are easy to operate. Don’t build in a driving distraction! Also make sure that the control head cable will reach the main radio unit, wherever you decide to mount it. 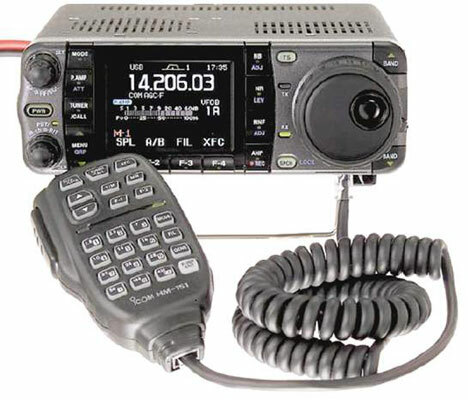 More and more HF radios provide a connector or two with a digital data interface built in so that it’s easy to connect a personal computer and operate on the digital modes, such as PSK31 or RTTY. A few even have a built-in data modem or a terminal node controller (TNC), which is a type of data modem used for packet radio. FSK (frequency-shift keying): A digital signal at this connector pin causes the transmitter to output the two tones for frequency-shift keying, a method of transmitting using two frequencies, usually used for radioteletype (RTTY). Data In/Out: If a radio has an internal data modem, you can connect these digital data inputs and outputs to a computer. You may need an RS-232 (a type of serial communication) converter. Line In/Out: Audio inputs and outputs compatible with the signal levels of a computer’s sound card, this input is used for digital data when a computer sound card is used as the data modem. PTT: This input (the same as the push-to-talk feature on a microphone) allows a computer or other external equipment to turn the transmitter on and off. Discriminator (sometimes labeled DISC): This input is the unfiltered output of the FM demodulator. External equipment can use this signal both to indicate tuning and to receive data. To find out how to configure a radio to support digital data, look on the manufacturer’s website, or ask the dealer for the radio manual. Proper connections for PSK31 and RTTY operation should be included. If the manual doesn’t provide an answer, contact the manufacturer to ask how to hook up the radio.